Feebates are the best way to deal with global warming. They work fast and effectively, are ideology- and budget-neutral and come with the least risk of feeding a wasteful bureaucracy. They respect consumer choice and use market mechanisms to achieve the necessary shift away from undesirable products to better alternatives. Greenhouse Gas Feebates impose fees on specific products that cause greenhouse gas emissions. For each type of products, the proceeds of these fees will be used to give local support to better alternatives, in the form of rebates. In many respects, markets are best suited to sort out which products and technologies work best where and thus should get support through rebates. Rather than selecting which products are applicable for rebates, the main criteria should be that (1) they are local replacements for the item that attracted the fee, and (2) that they are safe and (3) that they are clean, i.e. that they cause little or no emissions of greenhouse gases, or - even better - that they are greenhouse gas negative. Feebates can be adopted globally, but are best executed locally. Reduction targets can be agreed to globally, while the percentages of the fees and the rebates can be set locally. Fees can be adjusted on an annual basis, depending on how successful the area is in accomplishing the necessary shift and achieving its targets. Fees can be collected on items that are sold locally, or - if necessary - fees can be imposed on imported items. To avoid that a country persistently fails in meeting its targets, countries can jointly agree to impose trade sanctions, such as tariffs on products exported from such a country. This feebate will discourage the use of fossil fuel, while encouraging local supply of clean and safe energy. Rebates could apply to both produced energy (e.g. by solar panels or wind turbines) and stored energy (e.g. in batteries of electric cars, or in the form of hydrogen or pumped-up water). This feebates discourages the use of artificial fertilizers, while encouraging local sales of agrichar (or biochar) produced by means of pyrolysis from biowaste. This feebate will discourage sales of appliances with a high energy use, while the proceeds are used to fund local rebates on more energy-efficient appliances. This feebate will discourage sales of new fossil-fuel-combusting engines for vehicles such as cars, helicopters, boats and ships, while making it more attractive to buy electric motors instead. Rebates could also be paid out on motors in conversion of existing vehicles to electric vehicles. This feebate discourages consumption of meat, while encouraging consumption of vegan organic food instead. Local restaurants could offer rebates on the vegan-organic meals they serve, both for take-away and dine-in meals. This feebate encourages people to plant trees on their property, and to keep a minimal number of trees large enough to obtain the rebate. Relating to Exceptional Trees - Establishes an income tax deduction from gross income for amounts paid by an individual taxpayer for expenditures to maintain an exceptional tree on the taxpayer’s real property. The deduction, up to $3,000 per exceptional tree, is allowed once every three consecutive taxable years. Applies to amounts paid in taxable years beginning after December 31, 2003. This feebate will discourage sales of high emission vehicles, while making it more attractive to buy low emission vehicles, such as battery-powered electric cars and hydrogen cars. Rebates could also be paid out on conversion of existing vehicles to zero emission vehicles. Coolants - high fees on polluting coolants for use in appliances (e.g. HFC coolants), with proceeds used to fund rebates on green coolants for use in refrigerators, air conditioners, etc. This will discourage sales of incandescent light bulbs, while encouraging sales of better alternatives, such as compact fluorescent bulbs (CFLs) and light emitting diodes (LEDs) lights. This feebate could help reduce the usage of Nitrogen Trifluoride (NF3) as a cleaning agent, funding rebates on alternatives such as as fluorine gas. Fees are imposed on new buildings that comply with minimum LEED standards, while rebates are granted on new buildings that comply with high LEED standards. This feebate will discourage the use of polluting concrete (i.e. that contributes to global warming), while encouraging to instead use local supply of cleaner alternatives. This feebate will discourage flying, while encouraging capture of carbon from ambient air, which will reduce CO2 levels. The carbon could be used as soil enhancement and for industrial purposes. Aviation - a 10% fee on conventional airplanes, with the proceeds used to fund rebates on clean airplanes. High-emission vehicles can be prohibited from being driven on certain days of the week, on certain (lanes of) roads, or in certain parts of a city. Parking can also be made more expensive for high-pollution vehicles. As an extra incentives to shift to cleaner cars, this can be complemented with rebates when trading high-emission vehicles in for cleaner ones. The proceeds of parking fees and of fines could be used to fund such rebates. Fees could be imposed on removal of large (over 6 meters) trees from residential properties, funding trees planted in local parks, city squares and road-strips, and along local parts of highways and waterways. The following (slightly edited) post with six example feebates was earlier added by Sam Carana at knol (meanwhile discontinued by Google), where it was last edited July 24, 2009 and where it received 1110 views. It is added below mainly for archival and reference purposes. Feebates - the most effective way to reduce greenhouse gases. Abstract: Six feebates are proposed as the most effective way to decrease atmospheric greenhouse gases. 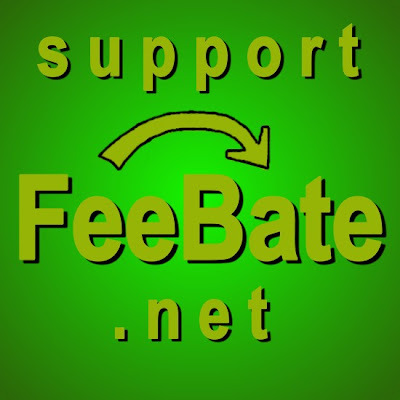 Feebates combine fees with rebates, in order to achieve specific market shifts. Fee are imposed on items that are to be discouraged, while the proceeds are used to fund rebates on better alternatives, thus helping these alternatives gain market share. Feebates minimize bureaucracy and favoratism. A feebate policy can fade itself out as the problem disappears.Feebates can be budget-neutral; proceeds from fee go directly to fund rebates, while all funding for the rebates is generated by the fees. The following six feebates have been proposed as the most effective way to reduce the greenhouse gases in the atmosphere. Additionally, these feebates can improve land quality, provide more energy independence, improve people's diet and health, create plenty of green job and investment opportunities and improve local balance of payments. Fees on fuel could fund local rebates on purchase and installation of facilities that produce energy in safe and clean ways. Rebates could apply to either facilities or supply of clean energy (newly generated energy by solar panels, wind turbines, etc, or stored energy such as in batteries of electric cars, or in the form of hydrogen or pumped-up water). Car feebates are the most well-known feebates. Fees are imposed on polluting cars, with the proceeds funding rebates on clean cars. Fees could be imposed on sales of new fossil-fuel-combusting engines for vehicles such as cars, helicopters, boats and ships, funding rebates to make it more attractive to buy electric motors instead. Rebates could also be paid out on conversions of existing vehicles to electric vehicles. Fees on flights could fund carbon air capture. This will reduce CO2 levels. Captured carbon could be fed into greenhouses or algae bags, be used for soil enhancement or for industrial purposes. Fees on construction work and buildings that cause pollution could fund rebates on building improvements and cleaner products. Fees on polluting concrete could fund rebates on local purchases of clean concrete. Green building feebates could lead to better insulation, better sun-orientation, etc, in order to stimulate energy efficiency, in addition to the above energy feebates. Discussed at: Green Building Feebate Policy and at: Carbon-negative building. Fees on combustion ovens could also fund rebates on building insulation, solar cookers and electric appliances for cooking and heating. A differential rates system could be implemented to avoid deforestation and degradation of land. Local councils could charge the owners of rural land more when there was a decrease in the carbon stored in the vegetation on the land and in the soil. On the other hand, where more carbon was stored, the rates would be less - land owners could thus end up being no rates at all or even be paid for their efforts. This system is essentially a feebate system that could be self-funding. Fees could be imposed on fertilizers made from fossil fuel. The proceeds could fund rebates on biochar. Another feebate policy could impose fees on sales of animal products, such as meat, dairy products, leather and glycerine. The proceeds could then be used to help make consumers switch to alternatives, by funding local rebates on such alternatives. This would make better products such as vegan-organic food more competitive in the area. Alternatively, the proceeds of fees on livestock products could fund efforts of landowners to plant more vegetation and add biochar.